First, ask yourself. . . am I ready for a puppy? Is my family ready for a puppy? Which breed is best for me? Here's a little bit of information on Labradoodles, Labrador Retrievers, Poodles, and Cockapoos! Kid Friendly, Clever, Eager to Please, Devoted, Better for allergies, Obedient, Easy to train, Full soft coat that grows 3"-4", friendly, city and country dogs, and great personalities! 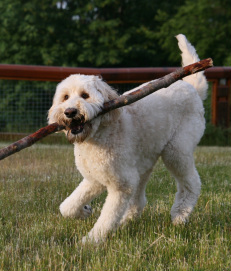 Labradoodles are a truely amazing breed. Even their existance is a remarkable reason. There was a visually impaired women in Hawaii, who wanted a guide dog that would also be good for someone with allergies. This is the reason for the breed. They sent to Australia (for customs reasons) for the dog to be bred. The first reports of a labradoodle is 1988 or 1989. Mixing a Standard Poodle, who already has a hypoallergenic coat, with a Labrador Retriever, known for obedience and mild temperment; gives you a Labradoodle. They are highly intelligent, eager to please, little to no shedding, great family dogs! A Labradoodle's coat does not shed much, however due to the breed's hair growth, this breed of dogs needs brushing on a regular basis in order to keep the coat from matting. At approximately seven months, this breed gains its adult coat and it is at this age you should begin grooming the dog. Make sure to not use a brush or comb that can damage the coat, as this causes future issues with the dog's coat. If there are mats that cannot be brushed out, then thin them out with thinning shears. It's best to use a combination of clippers and shears in order to achieve a haircut that effectively preserves the dogs look and not serve to make them look like a poodle. When grooming the ears, gently cut out the excess hair inside of the ear and then shave the hair near the ear canal on the underside of the ear. You can shave or thin out the hair on the outside of the ear so it will not appear as shaggy, and the hair will lie flat. When working on the muzzle, trim it an equal length all the way around. Also, trim any hair near the eyes that is obstructing the dog's vision. Now, round the feet to pads, trim the nails and trim out all hair in between the pads. Bathing your dog. Let me say that you don't want to bathe your Labradoodle with anything but a gentle shampoo. Also, avoid giving your Labradoodle frequent baths as this can strip their skin of oils, which causes drying. Once the dog is bathed, let the dog's coat air dry, as this reduces the possibility of any tangling that might occur. 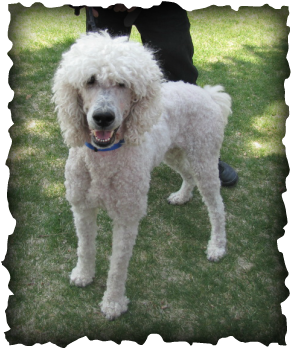 The AKC state that a Poodle is as follows: The Poodle is exceptionally smart, active and excels in obedience training. The breed comes in three size varieties, which may contribute to why Poodle is one of the most popular breeds according to AKC® Registration statistics. Poodles can be a variety of solid colors, including white, black, apricot and gray, but never parti-colored. Some believe the breed originated in Germany as a water retriever. His hypoallergenic coat may reduce allergic reactions, but requires regular professional grooming. The stylish "Poodle clip" was designed by hunters to help the dogs move through the water more efficiently. The patches of hair left on the body are meant to protect vital organs and joints which are susceptible to cold. The Standard variety is the oldest of the three varieties. The Miniature variety may have been used for truffle hunting. The Toy Poodle was often used in performances and circuses. The Poodle can accommodate nearly any size living quarters. The Poodle is an active breed and requires daily exercise. Standard: over 15 inches tall at the shoulder; Miniature: over 10 but under 15 inches; Toy: 10 inches or under. This is Momma Roxy as a Pup! An ideal sporting and family dog, the Labrador Retriever thrives as part of an active family or as a trusted hunting companion. A double-coated breed which sheds seasonally, regular grooming keeps his coat at its water-resistant best. 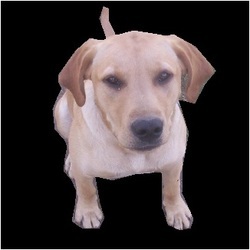 Monthly bathing, to not dry out the natural oils on thier skin, and regular brushing will keep a lab in great shape. They naturally want to run for the water! The Labrador Retriever is a strongly built, medium-sized, short-coupled, dog possessing a sound, athletic, well-balanced conformation. The most distinguishing characteristics of the Labrador Retriever are its short, dense, weather resistant coat; an "otter" tail; a clean-cut head with broad back skull and moderate stop; powerful jaws; and its "kind," friendly eyes, expressing character, intelligence and good temperament.